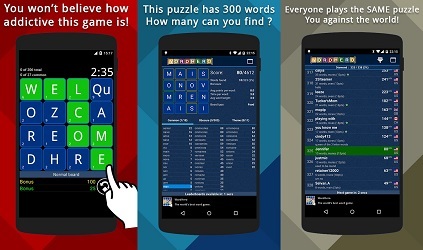 Word Hero is a free to play ad-supported word search game developed by SVEN Studios Corp.. The game is basically a "massive multiplayer online" clone implementation of the classic Parker Brothers board game Boggle. 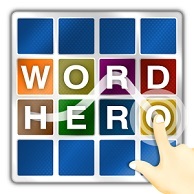 In the game Word Hero you are presented with a 4x4 grid of letters and two minutes to make as many words from them as you can by sliding your fingers between the letters and connecting them in and direction to form words. The longer the word is, and the more obscure it is the higher you get scored for it. In each puzzle some of the letters have a small dot on it, you get bonus points for using those letters in at least 5 words. There are other letters with two dots on them and you get more bonus points for using those in 10 words or more. At the end of a two minute puzzle round, you are presented with a score sheet showing you how many words you found out of the total that the puzzle contained. You also see a list of normal words and obscure words that were contained in the puzzle with the ones that you found highlighted, as well as other stats and charts. After 20 seconds you see a screen that shows how you ranked against all of the other people online who just played the same puzzle. This tells you what "place" you got, as well as giving you a percentage of the number of people you did better than. After 20 more seconds, a new puzzle is generated and a new round begins. It is very easy to find yourself passing a lot of time like this without realizing it, it is quite addictive and has that "one more round" quality. As you play the game more and do well, you are promoted into ever advancing "leagues" that present harder puzzles and stiffer competition. You begin in the bronze league, and progress to silver, gold, platinum, diamond and beyond depending on the skill levels you achieve and how fast you are with your finger. As previously stated the game is quite enjoyable if you are into word searches and puzzles. The game is free to play, offers no in-app purchases or pay to win mechanics, and is supported by small banner ads that only display between rounds on the scoring screens.